If you’re like me, you set your alarm to go off just before the news and weather reports on the radio. That way, you can lie there and not have to get up yet still get the weather report. But what if it’s one of those mornings where you keep hitting snooze over and over again and you miss the weather? Since I rely on the report to figure out what to wear that day, it’s a bit of a problem if my snoozing ways ruins dressing appropriately for the weather conditions. Who wants to wear a sweater if it’s going to be 70 degrees outside? 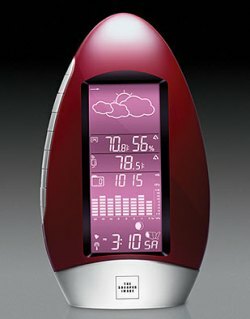 The Sharper Image offers the Waterdrop Weather Station Clock. This multi-function alarm clock features U.S. Atomic time and date and an alarm clock setting. With the hands-free infrared sensor, all you have to do to silence the alarm clock and activate a five-minute snooze is to wave your hand in front of the clock’s infrared sensor. (No, waving a rude gesture at the clock will NOT give you more time to sleep!) Activating the snooze will also illuminate the screen for five seconds, giving you a clear view of the time. The illuminated LCD screen on this waterdrop-shaped weather station boasts a wealth of features, including weather forecast icons with a color code; temperature (F°/C° indoor/outdoor); humidity (25% – 95%); maximum temperature and humidity; barometric pressure (24-hour); and moon phase. The unit includes an outdoor sensor with a 433MHz transmitter for a super-long transmission range of up to 246 feet. The screen has a changeable back light with three different options, as well as illuminated digits for easy nighttime view. Can be set up on desk or wall-mounted. Measures 5.7″ x 9.8″ x 2.2″ and weighs 1.4 lbs. Runs on 4 AA batteries (not included) or with plug-in AC adapter (included). Pick one up today for $119.95.